In this paper, we propose an inexpensive and compact gel document system in an Internet-of-Things (IoT) form employing recent open platforms. The proposed system adopts a smartphone camera developed for an open platform and uses blue LEDs as the lighting device with a recently commercialized light diffuser. The camera is controlled with the open IoT platform to implement the system in the IoT form. Employing open platforms greatly reduces the cost and size of the gel document system. The light diffusers are experimentally compared and the diffuser that made the proposed system more compact is selected. The proposed system has good characteristics of the IoT system such as low price, small installation space, and Internet controllability. 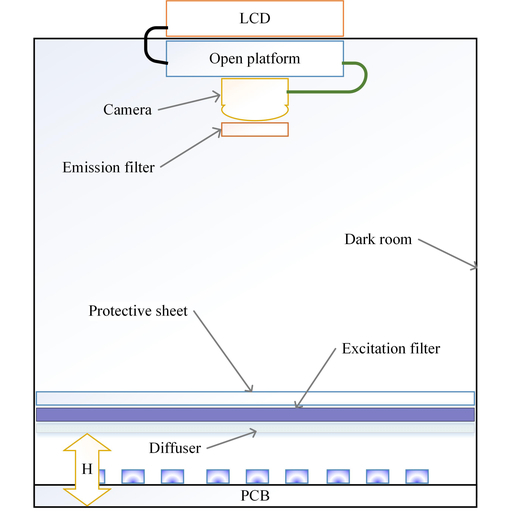 Seul-Bit-Na Koo, Dong-Geon Jo, Chan-Young Park, Yu-Seop Kim, Hye-Jeong Song, and Jong-Dae Kim, Low-cost Miniaturization of Gel Document System Using Blue LED, Sens. Mater., Vol. 31, No. 2, 2019, p. 377-385.